My best catch record this week! 246 quahogs. I’ve been picking them for the better part of my 61 years. 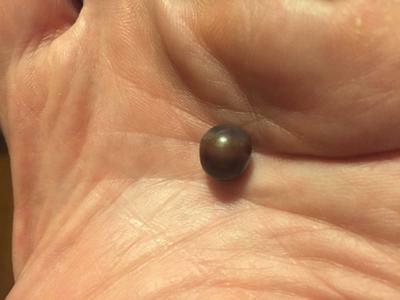 This is my first pearl. Any idea what it’s worth? Wow, after all those quahogs you deserve to finally find a pearl. And a beautiful one at that! They are normally appraised between $200-800/carat. God bless and thanks for sharing. Join in and write your own page! It's easy to do. How? Simply click here to return to Quahog pearls.